In 1863, Booth served one year as State Senator. 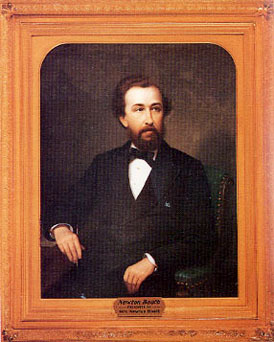 He was sworn into office as Governor on December 8, 1871. Construction of the state capitol completed and the state debt decreased during his term as Governor. In 1873, Booth helped organize a new independent republican political party, the "Dolly Vardens." The name, Dolly Vardens, came from a calico pattern of the time that was composed of many different colors and figures. Since this new political party was made up of a mix of “sore heads from any party or by any name,” the name seemed appropriate. With the support of the Dolly Vardens, Booth was elected to the U.S. Senate. He controversially remained in office as Governor until his swearing-in ceremony as Senator 18 months later. This questionable move prompted an attempt to amend the state constitution to prevent similar situations from occurring in the future. A bachelor while in office, Booth married the widow of his former business partner in 1892. He died only five months later. Booth, considered one of the great public speakers of his day, died of cancer of the tongue. Use the California State Library’s interactive tool to view Executive Orders and Proclamations signed by Governor Booth.